Shin Megami Tensei is one of my favorite video game series. So when a game under that umbrella disappoints me, it really stings. After playing and really enjoying Persona 4 on the PlayStation 2 back when it came out so many years ago, I recently attempted to revisit it via Persona 4: Golden on the Vita. For the most part, I loved it once again. As more of an adult now, I really appreciate how as a whole, the Shin Megami Tensei series is embracing wider difficulty options. I still appreciate the anime pop aesthetic, and the darker themes underneath the bright colors. However, in a game in which the primary theme is “reaching out” to the “truth” in oneself, or coming to terms with the jaded edges on one’s self, Persona 4 manages to completely drop the ball. This is because Persona 4 flirts with notions of queerness, and instead of using them to reinforce that primary theme, pulls back at the last second and antagonizes its own characters for possibly making “incorrect” choices. For the most part, the character vignettes powering Persona 4’s themes of self are pretty straightforward. Yosuke struggles with moving away from an urban environment, initially feeling like he’s above the rural life. Chie struggles with being less popular than her friends because of her obscure interests. Yukiko nearly crumbles under the pressure of her family’s socio-economic status. These are immediately relatable or familiar struggles that cast a wide net, making these characters more accessible to the wide audience. However, two characters, Kanji and Naoto, are struggling with concepts that are far more insular, especially in 2008 when Persona 4 was new. Kanji’s whole deal is he’s the game’s bancho, a scary delinquent who hits enemies with folding chairs, puro-style. He’s loud, brash, and at a glance, super masculine in a borderline toxic sense. When he starts getting involved with the story, nearly the entire Scooby gang is afraid of him. But as his storyline progresses, the player and gang come to realize there’s more to Kanji than meets the eye, and that “more” quickly implies Kanji is struggling with his sexuality. He has sewing skills, and is shown helping a child repair a stuffed animal. He thinks things like animals are cute, and most notably struggles with an attraction to Naoto (more on her in a bit). Kanji’s dungeon (each dungeon is a sort of manifestation of a character’s internal struggle) is a hypersexual bath house, with Kanji’s shadow self prancing around in a towel and speaking with a hyperbolic lisp meant to directly imply he’s gay. Kanji eventually accepts this part of himself, and the story ends up being framed as a sort of challenge to gender perceptions and masculinity. In brief, Kanji can still be a cool mandude and like sewing pillows and stuffed animals. But he’s totally not gay, and Persona 4 goes out of its way to make sure you know that. Because if Kanji is gay, that would be an actual problem? 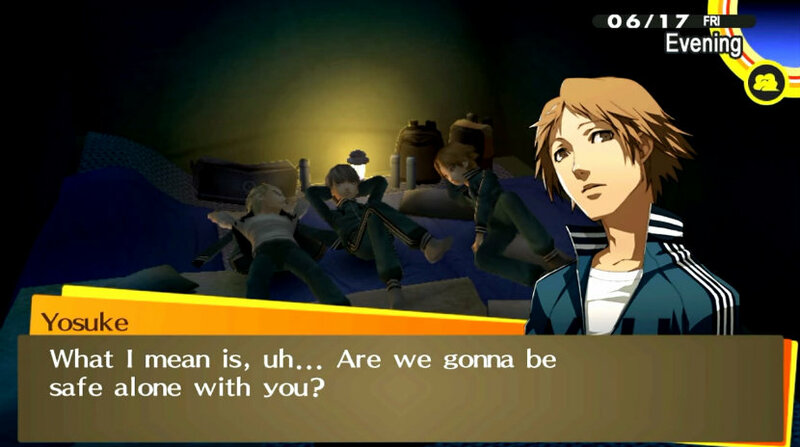 If you see this scene in the game itself, Yosuke is practically screaming at Kanji. He’s legitimately distressed through his assumption that Kanji is gay, and the game proceeds without ever challenging Yosuke on this moment. When that sort of thing happens in a text, that’s an endorsement on behalf of the writer. In fact, this scene and others in which Kanji struggles with who he is attracted to often have a comedic tone, making the possibility of his queerness into a gag, an ongoing bit. In Persona 4, Kanji being gay is not only incorrect, but the very notion of it is a joke. What makes it worse is how Kanji’s internal struggle is eventually resolved. And to get there, we have to talk about Naoto. Naoto’s arc revolves around her desire to be a career detective, something she’s already pretty much gone professional with by the time Persona 4 starts. She’s working with the police department, already known as an “ace,” and plays a key role in the Scooby gang figuring out what the heck is going on with the “TV murders.” Naoto struggles with the police department taking her seriously because she’s a literal child, but there’s a lot more to her story than challenging a generational gap. Naoto, before her story concludes, initially presents herself as a male. Everyone refers to her with he/him pronouns, and this directly ties into Kanji’s story. Kanji is immediately attracted to Naoto, often struggling to talk to her, blushing, and generally acting like a lovestruck idiot whenever the two meet. Initially, this plays into the question of whether or not Kanji is gay, but of course we end up discovering that Naoto is actually a woman. 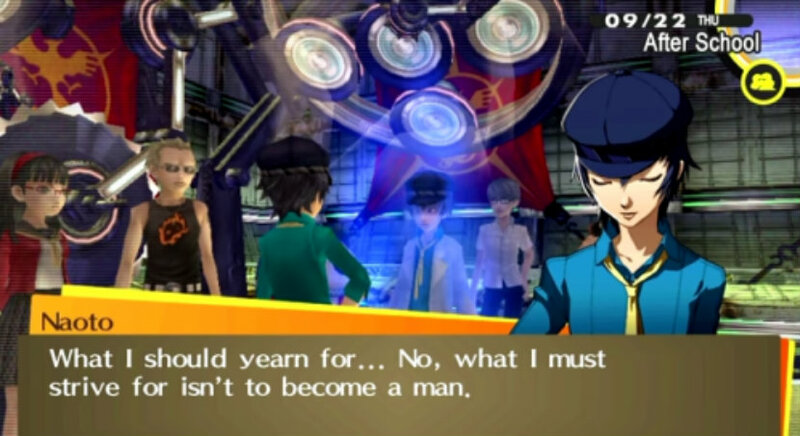 Within the text, Naoto presents as male not because she suffers from gender dysphoria, but as an extension of the previous issues with the police not taking her seriously. Since she can’t change her age, she feels like living her life as a male allows her to bypass societal sexism to make her dream of being a detective easier to achieve. No longer being looked down upon by her professional peers is her ultimate goal. Here’s where it gets really bad. If you’re not buying what I’m selling here, you may be wondering why it’s such an issue that Kanji isn’t gay or Naoto isn’t trans in the actual text of Persona 4. If you look at it like math, this is the story, this is how the author (or authors) told it, and while interpretations and readings are up to the eye of the beholder, ultimately that’s who these characters are. The problem is how, if you trace from point A to point B with Naoto and Kanji, nearly every step of the way is littered with disingenuous teasing and subtext that not only never goes anywhere, but is often peppered with cruelty. It’s almost as if the writers knew that injecting queerness into these storylines would draw people with those identities in real life towards these characters, then pointed and laughed after yanking the rug out from under them in the end. And if that’s not the case, the best case scenario is that this is straight up bad writing that contradicts itself on a foundational level, with no benefit to the story or characters involved. 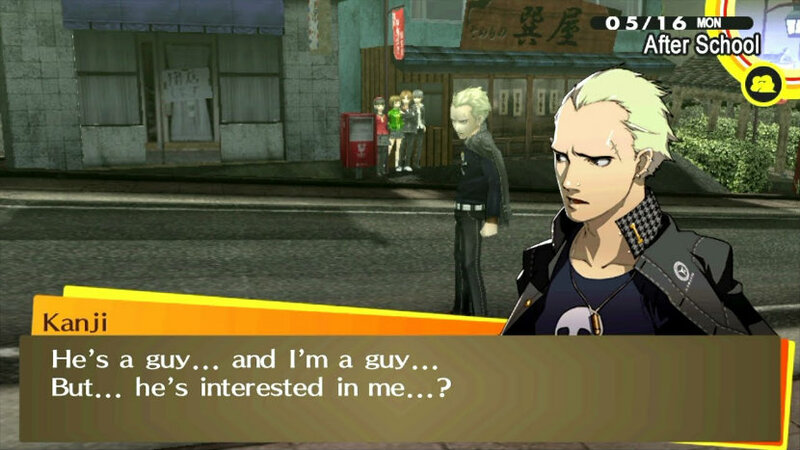 Kanji struggles with feeling Queer as he acknowledges his attraction towards Naoto Shirogane. His Queerness is canonical. He struggles and then finds his peace and is able to overcome his shadow. But the question of his established Queerness looms over the plot. How will this resolve itself inside of the storyline? Well everything wraps up very neatly when it is revealed that Naoto is a woman. Everyone, Kanji included, breathes a breath of relief. Surely even though Naoto was successfully living as a man Kanji’s feelings transcended perception and he was attracted to her because she was a woman the entire time. From then on Kanji joins Yosuke and the protagonist in being stereotypical, heterosexual pervs trying to pick up girls and practice heterosexuality. Not only does Persona 4 just drop two potentially interesting, nuanced portrayals of queerness that could have dramatically reinforced its core themes of self-acceptance, but it does so in order to placate a presumed status quo and tell bad jokes. It throws players living these truths under the bus along with these characters, and even presents a truly bizarre interpretation of human attraction on top of it. 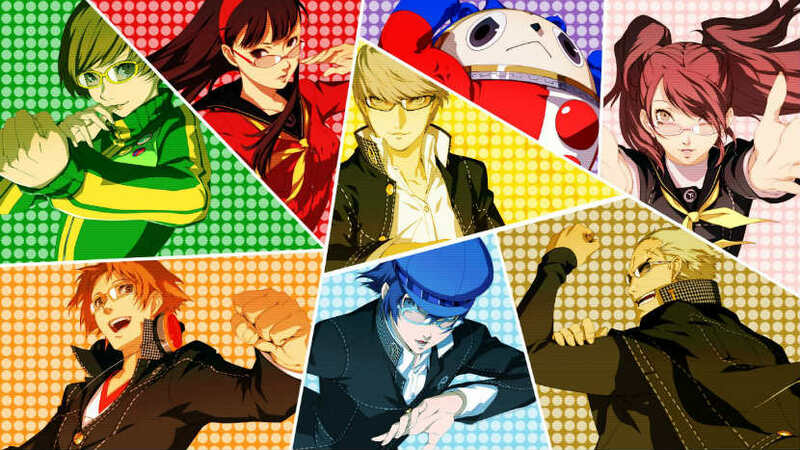 These storylines betray what Persona 4’s major conceit is, suggesting that in the pursuit of one’s inner truth, there are still right and wrong answers. While the wrong answer for everyone else is rejecting their truths, the wrong answer for Kanji and Naoto is diverting from heteronormativity. It’s disappointing enough to cast a shadow over the whole game for me, especially when titles like Shin Megami Tensei IV and Strange Journey tackle human nuance which much more thoughtfulness (although admittedly they approach this specific subject matter much less explicitly). Meanwhile, the Persona team, with Catherine: Full Body and Persona 5 running into similar criticisms, seems to still struggle with treating everyone with kindness despite the ostensible themes of its own works.